The Collected Interior: Week-end Shopping…Jonathan Adler's Happy Chic! 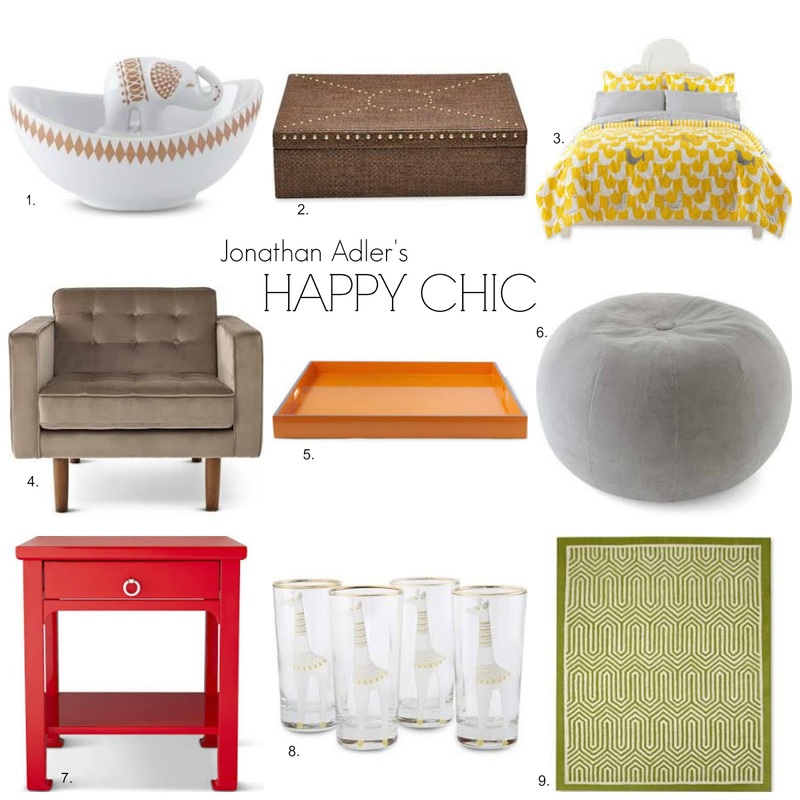 Week-end Shopping…Jonathan Adler's Happy Chic! Guess what I did over the week-end? Why just a little on-line shopping to check out Jonathan Adler's Happy Chic home collection from JC Penney! I love JA's JC Penney line - it so fun! I wonder if they are going to stop carrying it or if they are just clearancing out the old stuff to bring in some new. I've seen a bunch of it at HomeGoods lately! Kris I had that same thought too. I hope they don't stop carrying it, I love that JC Penney has such a fun n' chic line! ohh i like the look of those! How cute is the elephant bowl?! Stopping by from the SITS challenge. These are some great picks! I'm loving the ottoman and bedspread! Wow I love all of this! It looks like they carry some very stylish furniture! I could use a couple of new night tables, like the red one shown in your photo. Hi Jenna, they also have a turquoise one I love! Love JA and went crazy with his HSN line before, JCPenneys collection is no different! Stopping by with some SITS love :) That bedspread is incredible! Love the color and how happy it makes me feel. Thanks so much for sharing! Love this stuff and JC Penney's. Their new marketing strategy and product lines are really turning things around for them! Love Jonathan Adler...thanks for the info! Found you through SITS blog challenge. Happy Monday! I really like the round pouff! I'm getting ready to redo my office in yellow and gray, so it would match perfect! Gah, love Jonathan Adler stuff, especially those giraffe high-ball glasses. So adorable! I love the Crescent Heights Tufted Chair! Looks so elegant but comfy at the same time! That is such cute stuff. I live with my hubby and sons, so most of that would not work in our house. Thanks so much for sharing, a girl can dream design in her head! Love the Birds Complete Bedding Ensemble! So, so cute! Good price point too. Stopping by from your SITS tribe. Hope you have a great evening! JCP. Who knew? I never knew I wanted a Pouf until today. Stopping by from the SITS Challenge. I love everything on here! One day I'll finally decorate my apartment :) Stopping by from SITS! The bedding set is so pretty! I love JC Penney, they have really nice housewares. I wish I was better at decorating. Stopping by from SITS! I have one of his books and loved it. What fun to find the JCP is now carrying a collection he put together. The bird bedspread is to die for! I am obsessed with yellow!!! I had no idea that Jonathon Adler merchandise is sold at Pennys. I live in Manhattan and not too far from a J Adler store and the prices are fairly expensive. Who knew that I could get his stuff for so much less at Pennys? I like the yellow bedspread! Love the chevron rug! I can even imagine where I'd put it in my house. Spreading the comment love today! :) LOVE a good sale & that bedding is so great! Great finds! I had no idea he had a collection for JC Penny...love the nightstand and the highball glasses...so cute! !